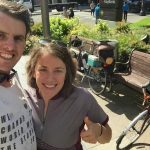 E322 – The Greens Go West Coast Bicycle Touring! Aaron Green is an experienced tourist-by-bike who wrote the memoir We Were Like Sons. Jada Green married a celebrity and got to bring her dream of bicycle touring the west coast to life! 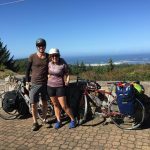 This fall the magnanimous couple rode from Portland, Oregon to San Diego, California. 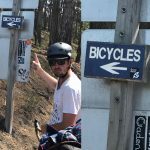 We chat with them about early mechanicals, transit use in San Simeon, amazing food experiences, meeting other tourists, and chatting with a disgruntled driver, among other things! Patches for Harry H. in Walnut Creek, CA! From EJ: talks that Jeff Speck has given at Ted about walkable cities!